A little something for BIG CLEANING !! Sigma is introducing an creative tool for brush cleaning named "Sigma Spa Express Brush Cleaning Mat" which is small in size, small in price with BIG RESULTS as its original version Sigma Spa Brush Cleaning Mat. Same 7 textures as big mat. Sigma Spa® Express Brush Cleaning Mat is an innovative device featuring 7 patented textures to wash both eye and face brushes. The mat includes suction cups on backside for secure placement on flat surfaces. Uniquely designed to fit most sinks at 32% smaller than the original Sigma Spa® Brush Cleaning Mat. Patent Pending. When it comes to cleaning makeup brushes, it is one of the most tedious tasks I have to do weekly. To put it in other words I always make sure that I am not using them dirty on my face and on my eyes. It's quite an intimidating task when you have an entire pyramid of brushes to clean which may take an hour or two depending on how many brushes you have without any exaggeration. Sigma Spa Express Brush Cleaning Mat made my life whole a lot easier without making my hands skin saggy and wrinkled up hands. Sigma genius at Sigma Beauty head quarter put a lot of brain, time, a lot of research and hard work by creating such unique textures for different brushes. I love how compact and how practical it is. Every inch of this mat has a purpose for being there which is great. It is made up of high quality silicon which is quite durable and light-weight. This is a smaller version of Sigma Spa Brush Cleaning Mat with same seven innovative textures to wash both face and eye brushes. It includes suction cups for secure placement on flat surfaces that fits most sinks. The different textures on the mat allow brushes to go under the process of wash, refine, refine plus, rinse. The various textures for face and eyes really helps you in giving your brush a deep cleanse, not just on the tip of the brush hair but the entire bristle. Wash section has thick round knobs that creates lather in a jiffy. Refine is my favorite texture as it has closely packed nubs that grasp the bristles of the brush in better way unlike palms. I just swirl by brushes and see makeup and soap residue coming off. Refine Plus texture gives an added benefit for an added deep cleaning of brushes. Throughout cleaning, I prefer to go on the Wash, Refine, Rinse, Refine Plus and Rinse as I can see my brushes (both face and eyes) coming out cleaner. I finished it off with Rinse by gently squeezing brush head to remove access water and let them air dry. I have not noticed any shedding whatsoever after cleaning my brushes which is a HUGE plus. To sum it up, I would DEFINITELY recommend this if you have a got a huge brush collection like me and uses them on daily/regular basin then this is MUST have. It saves your time and effort by minimizing them to half or more. I love using it as its effectively clean my brushes and I am already seeing myself to use it in a long run. Sigma Spa® Express Brush Cleaning Mat priced $25 and can be purchased from their official website here. They ships worldwide. You can get 10% OFF by using "SIGMAPINK" for the entire month of October on your order every time. No limits. 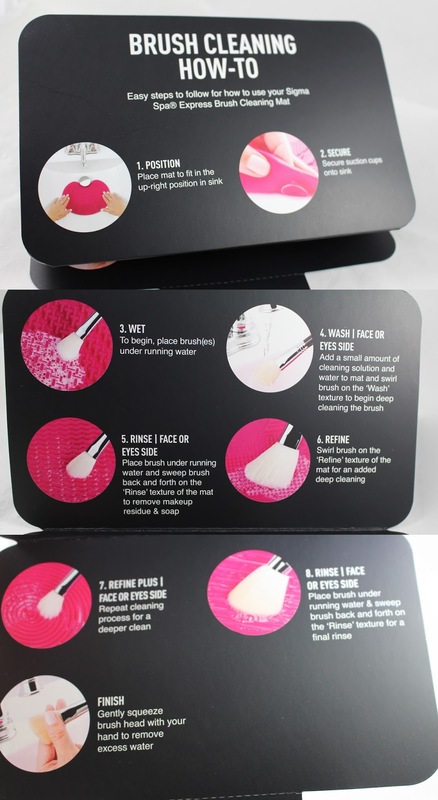 What do you think about Sigma Spa® Express Brush Cleaning Mat ? Have you tried it yet? 23 comments on "SIGMA SPA® EXPRESS BRUSH CLEANING MAT [Review]"
OMG, there is just about everything insane in the beauty actor. Does one really need a mat to clean the brushes? Owning a cleaning mat has been on top of my list. I'll surely try this one out soon judging by your review it seems like a great product. Wow didn't know makeup brush has its cleaning mat too. Didn't know this exist. I might as well get one for my brushes. Ah! the new one... im totally eyeing over this one though I already have other spa glove :P yet this one is so cute and ofcourse travel friendly. Genius invention. Possibly the best thing I have seen recently as everyone who uses make up brushes needs one! This is totally a lifesaver if you're a make up junkie. It saves time an effort. Im not into make up but this is worth an investment if you have brushes to clean at all times. This is a really useful product for all the beauty freaks out there! Thanks for sharing! The colour combinations and how clean the brush look afterward is amazing. I have never heard of this product before! I'd love to give it a try! This looks like a really useful cleaning item. At first glance, it reminded me of the face cleaner that looks almost like the brush cleaning mat but way smaller.